Sir, it is on record that the name Muhammed Buhari is well known all over the world not only as a mass murderer but also as a disdainful, unrepentant and big-headed religious bigot. You singlehandedly orchestrated the popular Asaba massacre that took the Lives of more than 800,000 innocent men and women within the space of two days. You stood by the side and watched while young girls and their mothers were brutally molested and raped in front of their fathers and husbands by some depraved and rampaging military officers from your clan ( Fulani ) who were solely under your command and control in Asaba. As a feudal over lord who was on a war of annihilation, you never raised an eyebrow but all you could do was to concretize their animalistic disposition by cheering them for a job well done! It is pathetically unfortunate that you never achieved any meaningful thing when you were still alive. You were only notorious in destroying the good lagacies of other people. While as a military head of state, you and your co traveller, Idiagbon recklessly plunged the economy of Nigeria into an irredeemable recession. Millions of people lost their jobs and livelihood. Dozens of companies folded and relocated to other neighboring countries because of harsh economic policies of your clueless government. There was demeaning and excruciating poverty among the citizens. People lived in hunger and hopelessness. Social vices skyrocketed to an unprecedented level.The strong preyed on the weak to survive. You ordered and supervised the destruction of peoples shops and looting of their wares in broad day light. Surprisingly, that was why the former president, Olusegun Obasanjo ( though not a saint ) called you a bad economic manager in his book, My Watch. Dear sir, before your demise, you were always parading yourself as an anti corruption crusader. Though you rode under the umbrella of anti corruption crusader to hoodwink and outsmart a more qualified and intellectually sophisticated personality called Jonathan. We have not forgotten how you dubiously looted 25 billion naira from the coffers of Petroleum Trust Fund ( PTF ) as the chairman of the organization. You failed to account for that money. You awarded fictitious contracts under PTF to your cronies and family members. Terribly enough, PTF became a fat cow for lazy criminals from Fulani dynasty. More annoying to the inimical evil you committed was when you lied about your Waec certificate during the last general election. You told the general public that your certificate was in the custody of the Defence Headquarters but after much investigation, it was discovered that there was never a time you enrolled for the examination but you unmeritedly got into the military through a hand written note from the then principal of your school in Daura, Katsina State. Sir, despite your numerous felonies against humanity, your cronies and family members have been really wicked and unfair to you. They are making things more difficult for you in the spiritual world, a place I know you are painfully paying for your crimes. 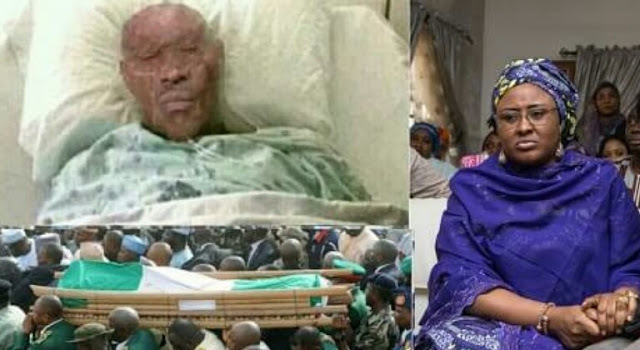 First, instead of bringing back your rotten carcass home for a befitting burial, they decided to dump your body in one of the cold rooms in London which is against Islamic law.They travelled all the way to Sudan to contract a hungry imposter called AMINU JUBRIL to stand in your stead. Your lovely wife, Aisha and children have gone on exile never to return or discuss anything about the man that is impersonating you in Aso Rock. Under your name as the president, we were told that rats invaded your office and chased a chicken hearted general like you away, snake swallowed millions of naira, monkey absconded with millions, Babachir swallowed millions in the name of cutting grass, $26 billion developed legs and disappeared from NNPC coffers, dead people were appointed to serve in your government ( corpsocratic government ), thousands have been maimed and butchered by your misguided brothers ( Bokoharam and Fulani terrorist organisation ) in the whole of middle belt. In South East and South South, operation python dance and crocrodile smile was initiated to kill innocent men and women who doesn't believe in the fake and unholy matrimony called Nigeria. People live in the fear of the unknown. A lot has been committed in your name. Sir, it will be reasonable for me to remind you that the doctrine of VICARIOUS LIABILITY will be used to nail you when you will be called to account for all these atrocities your cronies and love ones are committing under your name. Your rotten carcass will be exhumed wherever it might be hidden to answer for it. Conclusively sir, before it will be too late, you have to arrest the impending doom for the sake of your wife and children. The fate of your family will be terrible if you should fail to unleash terror on these vultures. I am invoking your incubus to act against these shenanigans that are making things more miserable for you. Strike people like Lai Mohammed, Femi Adesina, Garba Shehu, Orji Uzor Kalu, Audu Ogbeh, Mamman Daura, Aminu Jubril ( the imposter from Sudan ), Idris Kpotum Ibrahim, Bola Tinubu, Yemi Osinbajo, Abba Kyari, Rotimi Amaechi, Nasir El-rufai and Ismaila Funtua with leprosy and dumbness. Make them suffer for their sins. These personalities have reduced you to nothing. However, as you are gearing up to act upon my advice, may your soul never rest in peace! May you continue to suffer and wander in the spirit. You were a curse to humanity. Accept my letter in good fate.